After the last of the Halloween trick-or-treaters had passed through our neighborhood last fall, my wife and I watched our movie, The Fog. It has since been remade but we had the 1980 version with Adrienne Barbeau (Yowzah), Janet Leigh (Hotcha), Jamie Lee Curtis (Humma humma) and Hal Holbrook (damn good actor). It had enough scary moments to round out a nice Hallowed evening and we talked about it afterwards. “What’s the most frightened you have ever been?” my wife asked me. That is a really tough question. There are all kinds of potential frights in life, and they vary among individuals. Some years ago, I was commuting to a job in Poughkeepsie from Owego, New York. This is one of those “you can’t get there from here” deals, so everything got routed through LaGuardia. The Poughkeepsie to LaGuardia hop was so short that the attendant began taking drink orders while we were still taxiing out to the runway. The man next to me told her, “I am afraid of flying! 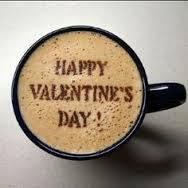 I want three Irish Creams – and I would like them now!” She didn’t argue the point and brought them to him shortly. He downed them one after another as the plane took off. For parents, a whole new category of worries is at hand. You have sleepless, restless nights if they have missed a curfew. A siren in the night or an unexpected phone call after hours can be a terrifying. There are also the sudden, unexpected scares that take our breath, make us feel that our heart has stopped – thought things over – and thrown in a couple of extra beats. I pondered my wife’s question and said, “I don’t believe I have ever had more hair raising experiences than the ones I had with Spock.” She nodded understanding. We moved south in the spring of ’79. I came down to interview and took the job at IBM. After we did some house hunting, I stayed on to work while my wife returned to the old homestead until our daughter finished her school year. The subdivision was a new one. Most of the lots were raw red earth laced over with kudzu. There were only two or three completed houses – there would eventually be over twenty. Our house-in-progress was directly across the road from one of the few occupants. I dropped by now and then to check on progress and occasionally camped out in a sleeping bag on the bedroom subfloor. On an early visit I made my first contact with this sparsely settled neighborhood’s resident guardian. An incredibly large, black animal – frothing at the mouth is no exaggeration – came bounding in a powerful gallop across the road toward me. I was between my car and my front door with no chance of reaching either, and no means of defense. Neither fight nor flight was an option. I was preparing for the worst when the lady of the house came running across the road and introduced me to Spock. “He won’t hurt you,” were the first words I heard from my new neighbor and it was the best welcome I ever had. Spock was a coal black Great Dane. Karen and Rodney had named him for the pointy-eared Star Trek character. 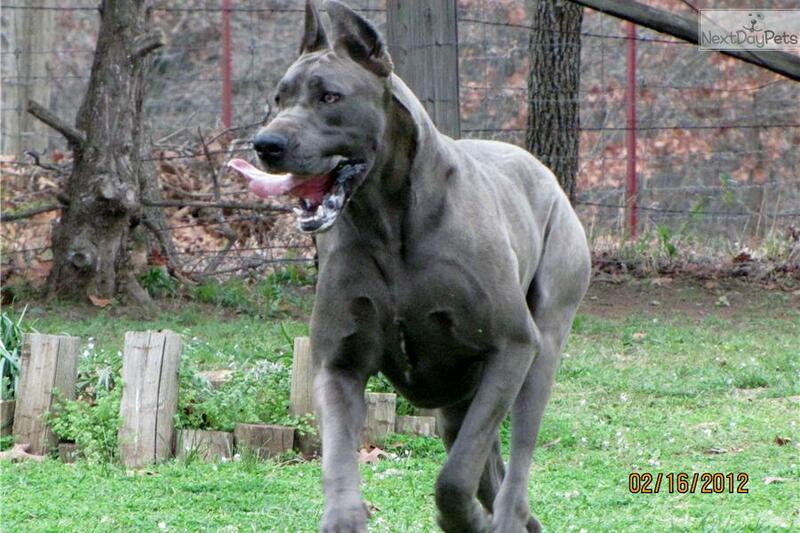 Great Danes are among the largest dogs on earth, and their gentleness and playfulness belie their fearsome appearance. Let me tell you how gentle: several months’ later, visiting grandchildren tried desperately to climb on his back for a ride. They quickly learned that he was a sucker for childish attention, with a very high tolerance for experiments of this sort. Once introduced, Spock and I became almost instant chums, a mixed blessing. If familiarity breeds contempt, it also breeds a playful urge to scare the bejeepers out of your new pal every now and then. Spock had a number of ingenious tactics to affect this. The foundation on the southern side of our house was faced with brick. Some Boxwood bushes were planted there. The low winter sun would warm up the brick wall and Spock loved to stretch his long frame between the wall and shrubbery when the weather was cold. I used a spot behind one of the larger plantings to keep our garbage rollout container out of sight. On one of my periodic trips to take out trash, I apparently wakened Spock from one of his snoozes, and he bounded up from his napping spot. I let out an involuntary yelp as this huge form leaped up from behind the low bushes to greet me. On subsequent trips to take out the trash I learned to prepare myself for other welcomes like this. Our new home had a fireplace and we looked forward to its cozy blaze on winter nights. I bought a pickup truck load of firewood from a local fellow, got a chopping block and axe and busied myself splitting the oak logs in the evening. I did my work on a little concrete patio in the back of the house. A single outside lamp was the only light source. I am busy chopping away one night, when an incredibly long black form – with no preliminary woof of warning jumps into the small pool of light illuminating my labors. Spock had done it again; yet another chink in my life expectancy. But it got scarier. Spock would apply his all time favorite heart-freezing tactic to me early on dark winter weekday mornings, as I left for work. He pulled this on me a half dozen times, and it never failed to work for him. You would think I’d learn after a time or two, but I didn’t. I drove a compact car in those days, and backed it out of our driveway to the road. As one customarily does, I would look over my left shoulder to check the drive behind me as I pulled out. And there – inches away at eye level – would be a huge, grinning, slathering, toothy face. It would take me a shocked moment to recognize…Spock! Spock has long since passed to the great kennel in the sky, and I confess I miss him – and yes, even his hijinks – to a point, though; to a point. Chuck Thurston is the author of the Senior Scribbles series on Second Wind. “Senior Scribbles Unearthed: This Whole Thing Has Sure Been A Lesson to Me”; “Senior Scribble Second Dose: Take Two Of These And Keep Your Mouth Shut” – and due out this fall: “Senior Scribbles Bathroom Reader: Your Results May Vary”. He and his wife Heidi co-inhabit their blog Twoontheaisle.wordpress.com. As a kid, I heard this story many times. My dad had a married nephew, my cousin – who was the son of an older sister, and much older than I (I won’t name names here). I remember him as a lanky, happy-go-lucky sort with a wide smile that often seemed a bit goofy to me. He didn’t take all those romantic occasions very seriously. 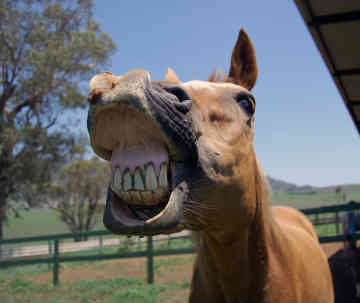 One Valentine’s Day, he got an old dried up horse biscuit from the pasture, wrapped it up, and gave it to his wife. Later on that day, she ground part of it up and put it in his coffee. The point was made, life went on and their marriage remained solid. Stories about pets always seem to have sad endings, so I was prepared to get a little emotional as I neared the end of “Marley and Me”, John Grogan’s book about his family’s goofy but loveable yellow lab. Sure enough, Grogan’s book got a snuffle or two from me as Marley passed on. It also got me thinking about the various dogs in my life — and one in particular. We were enthusiastic rabbit hunters on the farm where I grew up. Along with a shotgun, a good beagle was considered essential — and Judy was the best. The beagle is a bright, inquisitive — and I believe courageous — little dog, often no more than a foot high at the withers. They have one of the best noses in dogdom. When a rabbit is flushed they are on the trail with unmatched persistence and a thrilling bugle call that will make any true hunter’s heart race. They are great at their job precisely because they aren’t very fast! 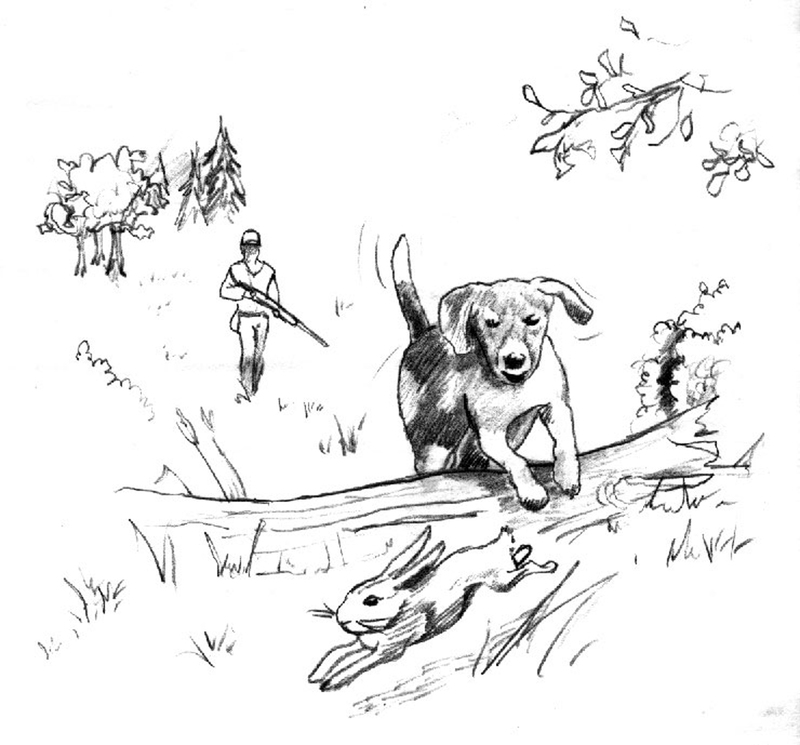 A rabbit rarely wanders far from familiar territory during its entire life, so, lulled into a sense of false security by the beagle’s failure to catch it, it makes a large circle and eventually hops back — and under the guns of the hunters! Ahhh…fried rabbit in the skillet tonight! One warm fall day, in my mid-teens, I took my shotgun, called Judy, and headed for the fields north of the house. I was enjoying the walk — perhaps more than the hunting — when suddenly a ring-necked pheasant raced through the weeds no more than 15 yards in front of me. I raised my shotgun and, as I fired, saw Judy cross in front of the gun barrel! She let out a yelp and tumbled head over heels. Later, I realized what had happened. Someone had winged the pheasant. Unable to fly, it had been running through the tall weeds — and these long-legged birds can really run. Judy had seen it and given noiseless chase, but I had not seen the little beagle hot on the pheasant’s tail as I fired at — and got — the bird. As I ran up to Judy, I saw — to my utter horror — that she was frantically rubbing at her eyes and nose with her front paws. I was sickened at the thought that I might have blinded my dog. I picked her up and looked her over. There was one bright streak across the bridge of her nose. Apparently a single pellet had creased her there. Within minutes she seemed like her old self, but I put the pheasant in my game bag and carried her home anyway. I found an ointment of some kind in the old farmhouse medicine cabinet and put it on the wound. She healed quickly, but carried the scar the rest of her life. I figured that, at the least, Judy would be gun shy from that point on, and useless as a hunting dog. I was wrong. Till almost the end of her days, Judy looked forward to a rabbit hunt with unabashed enthusiasm. Even when she became old and arthritic, nearly deaf, and unable to hunt, she would rouse from her pillow in the warm corner of our living room and give an excited little howl when my brothers and I pulled our guns from the cabinet to head for the fields on cold, crisp fall days. We knew what it meant to her. One of us would pick her up and carry her outdoors. We would walk a few yards toward the fields and sit her down. She would run around a little — searching for a familiar scent — but would soon tire. We would pick her up, carry her back to the house and return her to the pillow in the warm corner. Only then would we take off on our hunt with the younger dogs — leaving her, I like to suppose, to dream of crisp fall days and brushy fields and the scampering rabbits of long ago. “A Dog’s Life” first appeared in Senior Scribbles Unearthed by Chuck Thurston. The book is available through Amazon or Second Wind Publishing. Many years ago I dated a nice, pretty girl. For a while, we actually “went steady” in the mode of the day. I did not treat her particularly well. Oh, not abusive or nasty – just diffident and nonchalant (Think Travolta in “Grease” before Newton-John lights his fire). Our dates were pleasant enough, but I craved more excitement, I guess, and I would frequently drop her off after a date, and head for some noisy nightspot where things were really cooking. I thought about, and was vaguely disturbed about this behavior for some time afterwards. The country singer, David Alan Coe did a song on this once – You Never Even Called Me By My Name – it is probably his best work. I listened to it often over the years, but never associated it with any behavior I was guilty of until my old girl friend pointed it out. I was stunned, but she spoke the truth. Typical – “Hey Murphy (not her real last name), what movie would you like to see tonight?” Or perhaps some other anonymous – but not particularly endearing – descriptor: “Buddy”, “Pal”, etc., etc. As I looked back and thought about it, I began to see this behavior as one of the most dismissive actions in humankind between people who ostensibly should have some rapport. After my illumination, I vowed never do this again – I would try to approach people with the same honesty and sincerity I would want for myself. But the more I thought about this episode, the more I became convinced it was just one symptom of a much larger disease that afflicts most all of society. Many commentators say that civility is slowly disappearing in modern life. A frequent complaint in newspaper advice columns is the failure of people to offer a simple “thank you” when appropriate. Typically: A grandmother is distressed that her grandchildren never acknowledge the gifts or checks she mails out for Christmas and birthdays. “My boss doesn’t listen to me”, “I am never told what’s going on”, “I don’t feel my work is appreciated”, etc., etc., etc. Management generally calls these “communication issues”, and that’s fair…but I think that descriptor waters down the bigger problem. All of these examples deal with acknowledgement, pure and simple – and it is as necessary as oxygen to most humans, because it is affirmation – of our deeds, our contributions, and our very worth. We want it from family and friends, no less than our bosses, teachers, students – almost everyone in fact, that we have any kind of meaningful contact with. I now pay attention to the name badges on restaurant and store employees who serve me, and address them by name. It may sound trite, but it works. Their faces brighten and their service seems more…personal. I am damned picky about my lattes. I want a swarthy, no-frills drink that tastes as Lino Meiorin, the inventor, intended; good strong espresso and steamed non-fat milk, by golly. No sugar, no exotic flavoring. I don’t have to worry about whether or not Regina is going to get it right anymore. Some time ago, I went to the local supermarket with one of my wife’s Danish cousins. As I checked out my purchases, I got in a little banter with the cashier on some issue of the day. When we left, my companion asked me, “Do you know her?” I had to admit I didn’t. He was surprised. Chatting up strangers is apparently a common American trait, and not shared in many other cultures. If you hear, “We’re frankly not interested in what you have…” you really have your work cut out for you. That is precisely why Rhett Butler’s departing response to Scarlett O’Hara is so devastating. “Frankly, my dear, I don’t give a damn.” This signals a finality against which an appeal does not seem possible. And, to be sure, there are a lot of things in life I don’t give a damn about, and I’ll bet that’s also true of you. That shouldn’t, however, include our fellow planetary travelers.